KS Engineers, P.C. (KSE) was responsible for resident engineering inspection services for the construction of water mains; construction of sewers, catch basins, and chute connections; utility construction and relocation; construction of new curbs and sidewalks; roadway reconstruction; installation of street lighting and traffic signals; and landscaping. The project was funded by the federal government. It required adherence to federal and state regulations. The major items of construction work included: reconstruction of the roadways using granite block pavement on a one-inch thick mortar setting bed and an eight-inch thick concrete base; new four-inch and seven-inch pigmented concrete sidewalks; new granite curbs; new 15-inch ESVP combined sewers on concrete cradles; new 12-inch DIP water mains; reconstruction of existing brick sewers using the gunite method; new sewer manholes; street lighting; traffic regulatory signs; and pavement markings. Existing granite sidewalks will remain in place and sidewalk areas over street vaults will not be included in the construction contract. The contract uses joint bidding for private utility work and includes private utility replacement. This project requires extensive knowledge of federal and state regulations. Portions of the project are in proximity to NYC Transit Authority (NYCTA) facilities. The NYCTA reviews the contractor’s means and methods of construction where work is in close proximity to their facilities. 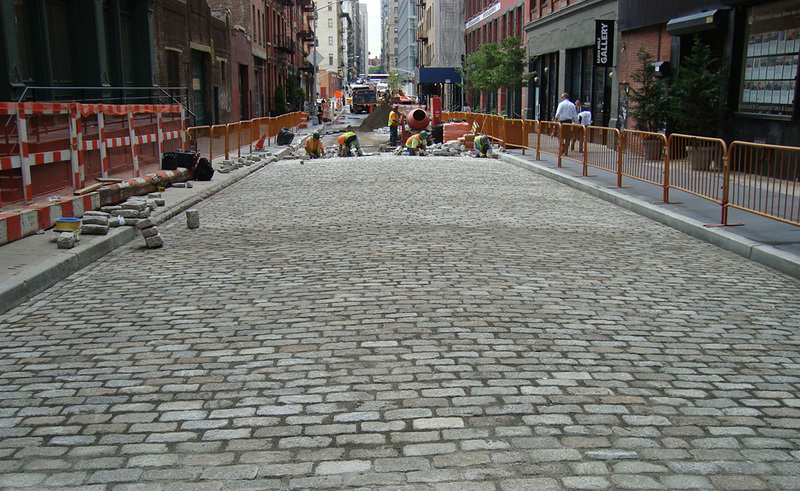 The three project areas include Harrison Street from West Street to Hudson Street, Leonard Street from Hudson Street to West Broadway, and Greenwich Street from Canal Street to Hubert Street.